You’ve got the power, anywhere, anytime. Slim and light, the powerful V-Twin unit will always provide the necessary amount of drive no matter what the situation. The grunt and power of the 1037cc motor is irresistible for an exciting ride, while ensuring when two-up riding with luggage. The flexibility and good-behaviour, combined with power for adrenaline. The V-Strom 1000 is driven by a powerful and versatile 90-degree, DOHC, V-Twin. The 101PS maximum output at 8,000rpm will give the rider an exciting riding experience, while the optimally weighted magneto and flywheel helps to produce a thick layer of torque of 101Nm as low as 4,000rpm, resulting in a tremendously usable character. 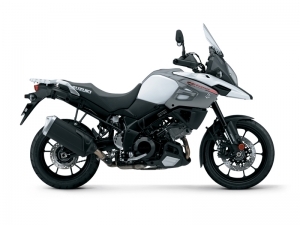 The V-Strom 1000 is built on a slim, twin-spar aluminium frame, providing a smooth ride, and a sporty riding experience when pushed hard, and also contributing to fuel economy thanks to its light weight structure. The aluminium swingarm is set to a length to provide straight line stability and cornering stability at a high level. The bike feels reassuringly steady at high speeds even when it’s fully loaded with luggage and a pillion. The V-Strom 1000 is equipped with some of the most advanced rider technology available, including a Motion Track Brake System¹, Advanced Traction Control System², Low RPM Assist and Suzuki Easy Start System. By adding the new design concept “Tough Gear” to the existing “Wild and Smart”, the new V-Strom 1000 now has a updated look, mainly in the upper cowling, in kin to its 645cc brother bringing the V-Strom family together. Suzuki’s original “Beak” style has been further emphasised by making it a straight line from the tip to the top of the tank, expressing the DNA from the DR-BIG and the desert racer DR-Z. The newly designed double stitched seat has a sense of quality, and the tandem area is parallel with the rear carrier providing a large flat space to securely strap large baggage when needed. Champion yellow is a new colour for the V-Strom 1000, relating to the off-road racing scene of Suzuki.